It is very important to purchase only from authorized dealers. Most manufacturers will only honor warranties for products purchased from authorized dealers. 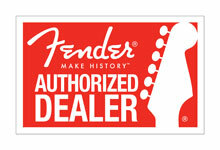 Pro Music is an Authorized Dealer of Fender® USA Electric Guitars and Basses, Frontman® and Rumble™ Amplifiers, Fender Acoustic Instruments, FMI Wholesale/ SPA and Parts, Fender Solid State Amps (less Frontman / Rumble), Fender Passport® and accessories, Fender Mexico Electric Guitars and Basses, Squier® Electric Guitars, Basses and Amplifiers, Acoustasonic™ Amplifiers, Fender Imported Electric Guitars and Basses, Fender Tube Amplifiers, Guild®, Gretsch® Electromatic, Jackson® USA Select, Jackson® Import, SWR®. Pro Music is an Authorized Martin Guitar Dealer. Pro Music is an Authorized Ovation Guitar Dealer. Pro Music is an Authorized Akai Professional Dealer. Pro Music is an Authorized AKG Acoustics Dealer. Pro Music is an Authorized American DJ Dealer. Pro Music is an Authorized Crown Audio Dealer. Pro Music is an Authorized dbx Professional Dealer. Pro Music is an Authorized DigiTech Dealer. Pro Music is an Authorized D’Addario Dealer. Pro Music is an Authorized Furman Dealer. 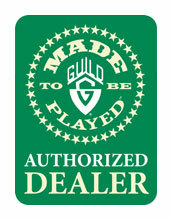 Pro Music is an Authorized Gibraltar Dealer. Pro Music is an Authorized Gretsch Drums Dealer. Pro Music is an Authorized Hal Leonard Dealer. Pro Music is an Authorized RapcoHorizon Music Dealer. Pro Music is an Authorized Hosa Dealer. Pro Music is an Authorized JBL Professional Dealer. Pro Music is an Authorized Mackie Dealer. Pro Music is an Authorized Minelab Dealer. Pro Music is an Authorized Paul Reed Smith Guitars Dealer. Pro Music is an Authorized Sabian Dealer. Pro Music is an Authorized Sennheiser Dealer. Pro Music is an Authorized Shure Dealer. Pro Music is an Authorized Soundcraft Dealer. Pro Music is an Authorized TASCAM Dealer. Pro Music is an Authorized Yamaha Dealer. Pro Music is an Authorized Proline Mining Dealer. Pro Music is an Authorized Jobe Dealer. Pro Music is an Authorized Javelina Reverse Helix Trommel Dealer. Pro Music is an Authorized California Sluice Box Dealer. Pro Music is an Authorized Hydro Force Dealer. Pro Music is an Authorized Pioneer Mining Dealer. Pro Music is an Authorized Gold Cube Dealer. Pro Music is an Authorized Eureka Joe’s Gold Concentrates Dealer. Pro Music is an Authorized Anderson Shafts Dealer. Pro Music is an Authorized Gold-N-Sand Dealer. Pro Music is an Authorized Sona Enterprises Dealer. Pro Music is an Authorized Summit Mining Dealer. Pro Music is an Authorized Gold Well Sluice Dealer. Pro Music is an Authorized Keene Engineering Dealer. Pro Music is an Authorized Fisher Dealer. Pro Music is an Authorized Cobra Crusher Dealer. Pro Music is an Authorized Spin It Off Dealer. Pro Music is an Authorized Garrett Dealer.